This post is really thanks to Mike, and results from a question he put in a comment, asking if I was scratch building all of my terrain. So hello Mike, and the short answer is no. Just most of it. But thanks for prompting me to finaly do somthing with these models. The Hovels buildings in this post were bought way back when Salute was still in Kennsington town all, and I was a young fresh faced designer working in London. They were bought with the idea of using them as the center of a relatively generic village which would fit a wide range of time frames and locations in 15mm scale. The central main one being 15mm Spanish war of succession. That original idea still stands, the only real change over the years has been the huge increase in range and quality of 10mm figure ranges available. This has lead to some of my periods of interest moving from 15mm over to 10mm, due to the size constraints I work within and also cost. More bang for your buck, as our American cousin's would say. 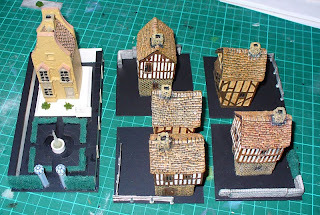 From my point of view although 15mm scale these buildings are fine for using with 10mm stuff as well. The building come from the Hovels European range and the Rural range, the 5 half timbers houses are still less than £4 each, which to me seems very reasonable. 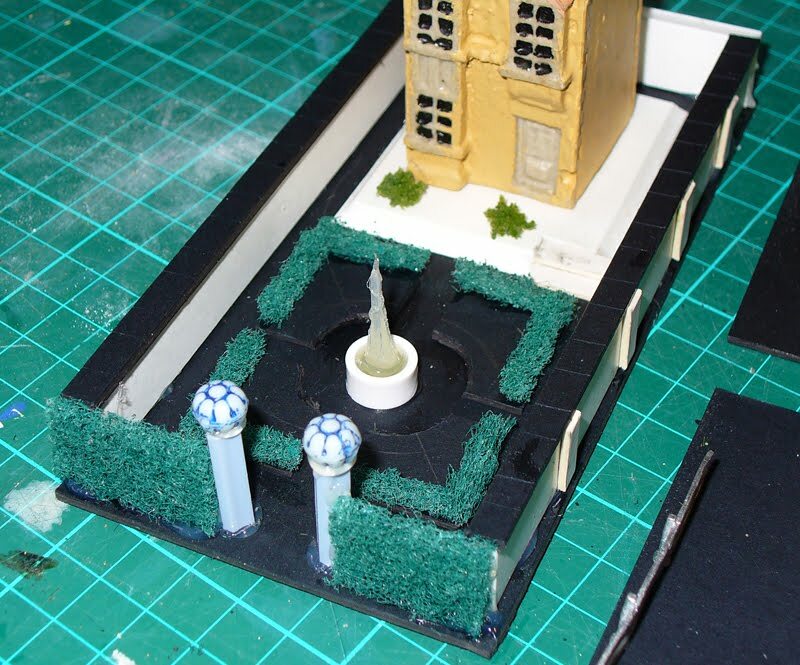 They are all going to be based onto 3x3 inch art board bases, with the Big house going onto a 3x6 inch base for its formal gardens to fit onto. With the houses I also bought a selection of stone walls, fences and stocks, I have an idea they were from Hallmark figures, but I could be wrong. So these will be used on the bases as well. The big house was put onto a foam board base within the walled garden, all the hedging is from pan scouring pads, cut to shape with a scalpel, the gate posts are plastic sprue from an Airfix 1/24th scale Hurricane. A nice hexagonal shape and the balls on top are from the daughter's bede tin. The formal fountain is a spindle from a boots floss dispenser. When hot gluing this to the base the glue started to pull up when I was moving the glue gun away. I had one of those eureka moments and thought, that kind of looks a bit like a fountain, so there it stands. Water feature number one. I'm sure other people must have done the same, but hay I was quite chuffed with the result.